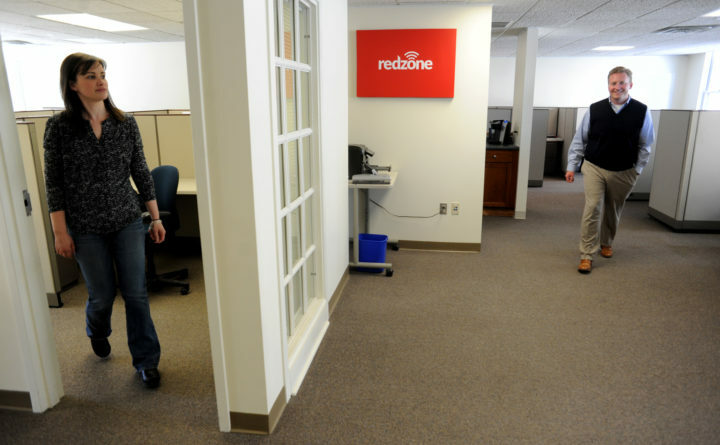 Inside the office space of Redzone in the Knox Mill Center in Camden, March 23, 2015. The Rockland-based internet company Redzone Wireless will soon offer its WiFi in Caribou, Fort Kent and Presque Isle this year as part of an expansion throughout rural Maine. The company announced Friday that it plans to expand to 26 new Maine communities this year, with portions of 50 adjacent communities also gaining access to the service. “Our goal over the next few years is to cover over 90 percent of all Maine residents so that they have the choice of Redzone Wireless,” Redzone Vice President of Sales Michael Forcillo said. Redzone Wireless launched in 2014 and offers high-speed internet through the wireless spectrum, like cell phones, rather than through cable and fiber. While the core residential areas and some parts of rural areas of many towns in Aroostook County have access to high speed internet, large swaths of rural northern Maine lack broadband infrastructure, and for some people the only option may be satellite.